I havn’t done a boys winter wardrobe post on my blog before. So I thought I should, especially because I have been lusting over so many items for both my children for this winter. I decided to do one for Archie first of all, as I really don’t have much say in choosing Sophia’s clothes anymore. I do like to give her that independence and let her choose her own, I still help her a little but not as much as I would like. 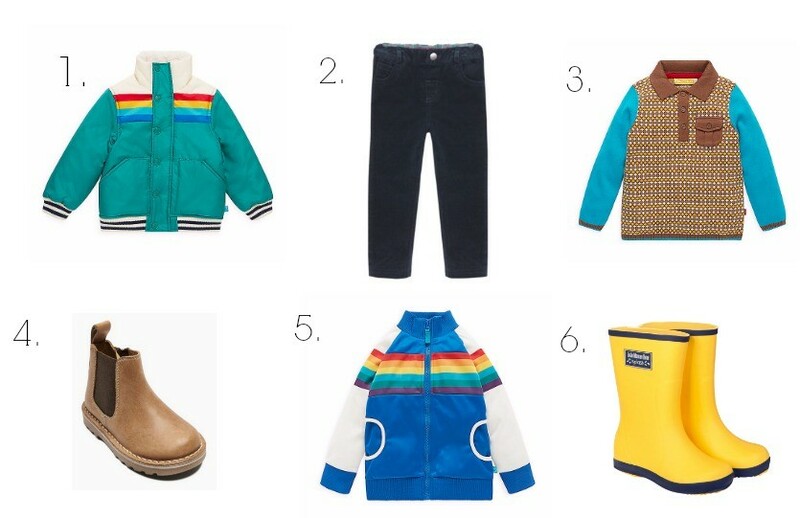 Here are just 6 lovely items from a few of our favourite shops to purchase the children’s clothes. Little Bird by Jools is recently a new find for me and I love all the bright colours for the children. I am definitely going bright for them this winter. Little Bird by Jools, Borg Lined Green Coat, size 2-3 £25. Archie is in desperate need of a new coat for this winter and I think this one is beautiful. I especially love it because of the bright green. Boys’ Navy Skinny Cord Trousers from JoJo Maman Bebe, size 2-3 £16. I do love me some cord trousers! I think children look so cute in them. I love them most because they are quite a ‘traditional’ style trouser. Archie used to have a pair but he was so young he only wore them once or twice, and came up a little tight. Little Bird by Jools Oliver Fairisle Top, size 2-3 £15. When I first spotted this jumper about a month ago I fell in love with it. I really really like it a lot and think Archie will look so cute wearing it. Leather Chelsea Boots (Younger Boys) size 8 £26. Archie hasn’t got any winter boots as yet. So when I was browsing and came across these I had to add them to list. It seems as though stepping in a little mud wouldn’t matter with these as I could clean them easily. As opposed to the lovely suede shoes you can buy for boys. Little Bird by Jools Rainbow Jacket size 3-4 £15. I have been eyeing this jumper up for some time now, for my children actually. As I think this will be perfect for most seasons even the summer as it looks light weight. I love the colours. Children’s Wellies from JoJo Maman Bebe, size 8 £16. I love these wellies, especially because they are yellow and very bright. Have you made a winter wish list for your little one? I’d love to have the links to yours to have a look. These things are just tooo cute!! I love when it’s a new season and you get to go out and buy a whole new wardrobe for the minis…boys clothes are just too cute. This post has reminded me that I need to pick my daughter up a pair of wellies now the rain has really arrived! I love the yellow wellies. Where I grew up we called them Gum boots. I want to get some new wellies for Sylvia my daughter- before the winter hits us!